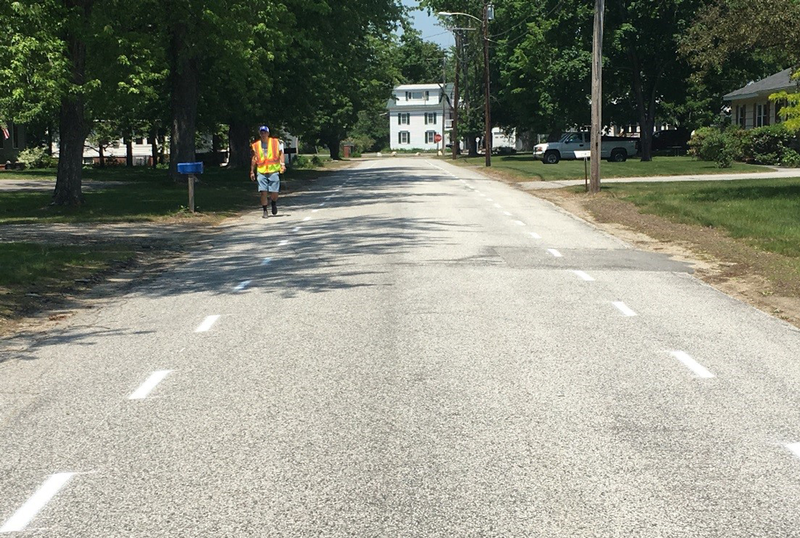 When community advocate Anne Gass approached the Bicycle Coalition of Maine (BCM) for help creating safer walking conditions for people on Hancock Street in Gray, Maine, Jim Tasse knew he had a good project. Tasse, APA Northern New England Chapter Plan4Health project leader and the BCM assistant director, was looking to test some of the processes and principles behind the “Imagine People Here Demonstration Project Toolkit,” developed with support from Planners4Health. Gass was wondering how to calm traffic and create safer conditions for people walking on Hancock Street, a roadway that connected a senior residential area and the town library. She had heard complaints from residents on the short street that some cars drove too fast and that there was no safe place to walk. Several of the seniors used Hancock Street for their daily walk, but they felt that something needed to be done to improve the behavior of drivers and create a walking area. People using walkers were particularly concerned about the cracking and crumbling pavement at the verge of the roadway. “The situation perfectly captured the problem that the Plan4Health program was created to address," said Tasse. "Older people ‘aging in place’ were challenged by their built environment, which was created primarily with the convenience of automobiles in mind and included no accommodation for pedestrians. "People walking were expected to share the lane with the light-but-steady traffic the library generated — a common enough situation that can work in many locations, but which was not working for the senior citizens who were in many cases walking to maintain their health as much as to reach the library." Working with Imagine People Here, the team planned to install multi-use advisory lanes: two dashed lines placed 5 to 6 feet from the edge of pavement along with some traffic signs. The road has no centerline, and the addition of the dashed lines narrowed the travel lane of the road to about 12 to 13 feet, which helps to slow cars. Multi-use advisory lanes implemented for demonstration project. Photo courtesy Northern New England Planners4Health Task Force. When two cars meet on a road with this facility painted on it, they move to the right into the dashed lanes to pass each other. BCM created a sign to post at the project site to help guide users on how the facility would work. The demonstration was planned to be in place for two months, from June to August. The goal was to show that a simple, low-cost measure could change driver behavior and improve conditions for the people walking on the street. As per the IPH Toolkit guidance, Gass worked with the director of public works and the town council to secure permission to conduct the demonstration, and sent an outreach letter to all houses on the street informing them of the project. In mid-June 2017, a team of volunteers painted the lines using the process outlined in the toolkit. An online response survey was created so residents could offer feedback on the demo, and signs were posted on both ends of the street with the address of the survey. The public works department installed the traffic sign. The Bicycle Coalition of Maine worked with a local MPO to install a camera to observe how the facility was used. 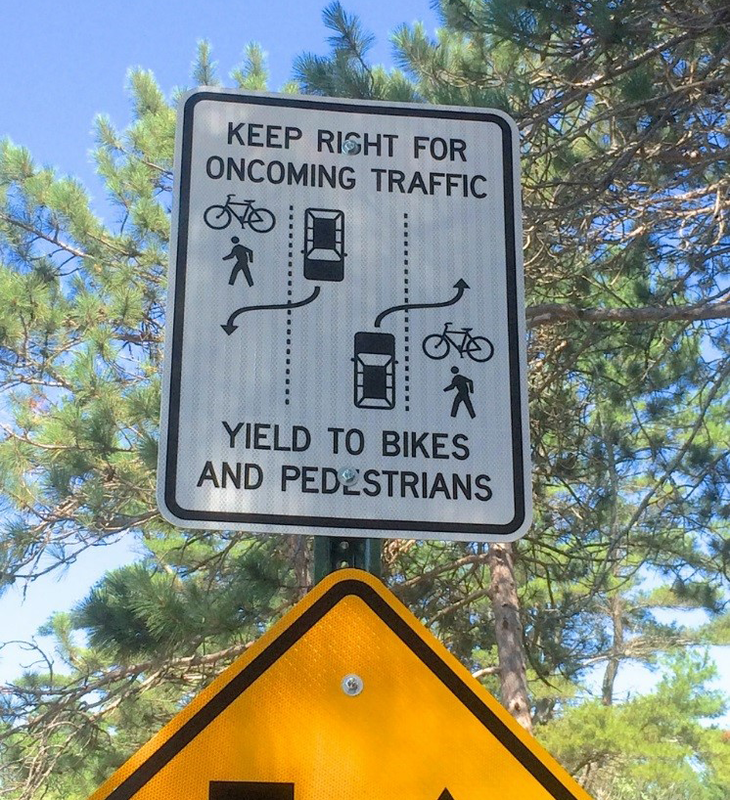 A traffic sign explained the new street markings in Gray, Maine. Photo courtesy Northern New England Planners4Health Task Force. The town did not send out the survey link to residents (a toolkit recommendation! ), so the number of responses to the survey was not as great as would be hoped. The few comments received covered the gamut of opinions: from drivers being irritated to thankful pedestrians wishing for more. The traffic camera, however, revealed that only 17 percent of drivers encroached on the advisory lane and that 42 percent of drivers kept to the center lane. About 38 percent of drivers kept to the right of the center lane, but did not drive in the bike lane. The video also seemed to indicate that cars were moving slowly down the street, perhaps in part out of uncertainty about how to use the new facility. These results are being presented to the town government to make the case for permanent installation, as well as for pavement improvements on the road’s edge. The demonstration project showed that something as simple as paint can carve out more space on public roads for vulnerable users out walking for health, recreation or transportation. Become a “tactical urbanist” yourself, and start demonstrating how the built environment can work better for people — not just people in cars! Top image: Northern New England Planners4Health team implements street markings in Gray, Maine. Photo courtesy Northern New England Planners4Health Task Force. James Tasse is Plan4Health project leader for APA's Northern New England Chapter and assistant director of the Bicycle Coalition of Maine.